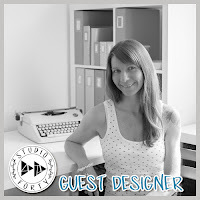 Ulli here with you today with my second guest design post at the Studio Forty blog. Thank you so much for having me one more time Monika! 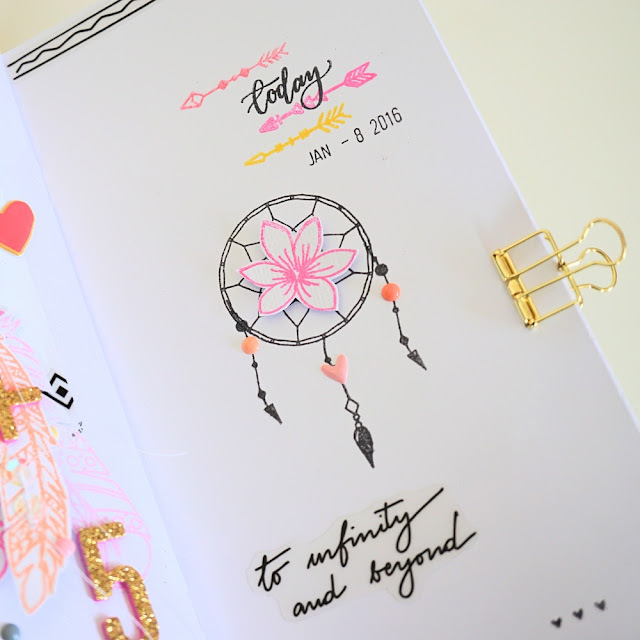 I am sharing two travelers notebook spreads with you today. I made them with the amazing new Studio Forty stamps and transparent stickers from the „Moon Child“ collection and some enamel dots and shapes from Studio Forty. After my layout and my PL double page I decided to do two TN spreads in my travelers notebook. I love this easy way to document some special moments. For the first one I used a photo from my pregnancy with our little son from 2016. I used it as a black and white picture and glued it on the left side above. Then I used a border sticker from the „Borders“ sticker set. 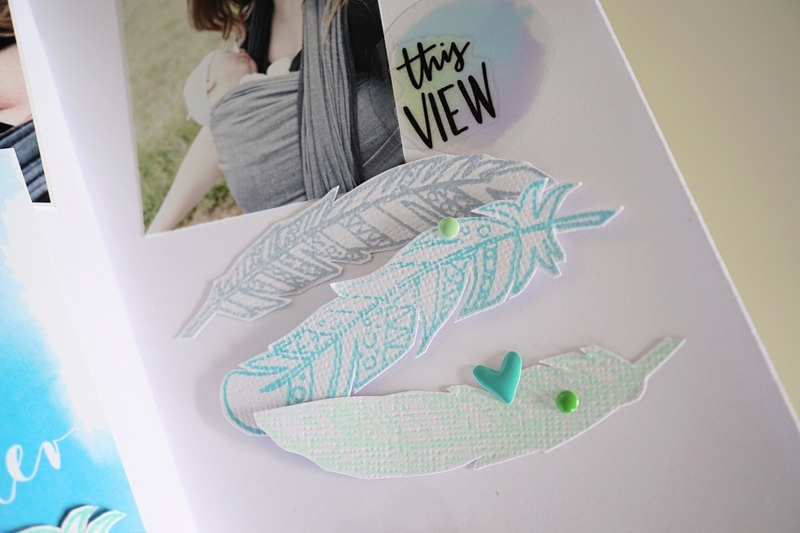 I am so in love with the amazing feather stamps -"Spirit of Nature" from the „Moon Child“ collection and so I stamped them three times in different colors on white cardstock and cut out the feathers then. I used the same color scheme like I used for my layout „Magical“ which I have showed you some days before. Then I stitched the three feathers together with my sewing machine. I also stitched two sequins on the feather in the middle. 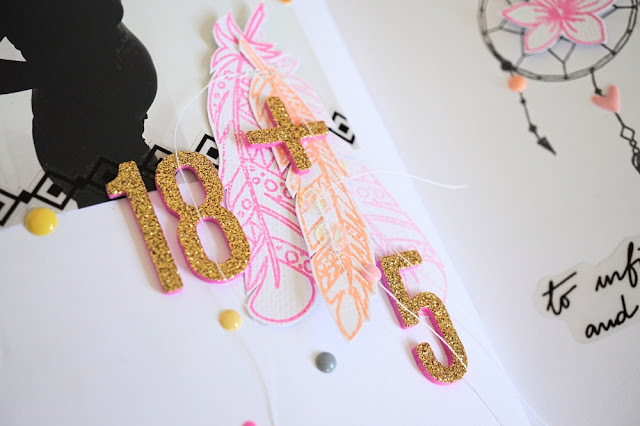 I glued them on the bottom of the photo and added the title with gold glitter foam alphas on the feathers. 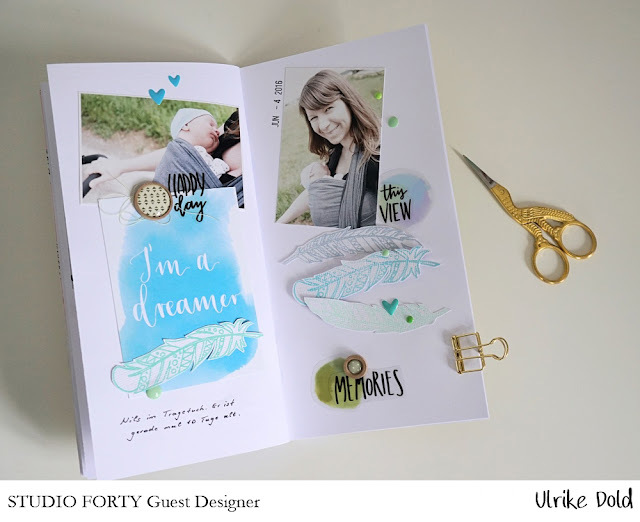 For the right side of this layout I added a transparent sticker border on the top and stamped the little dream catcher in black at the middle of this page from the "I'm a dreamer" stamp set . 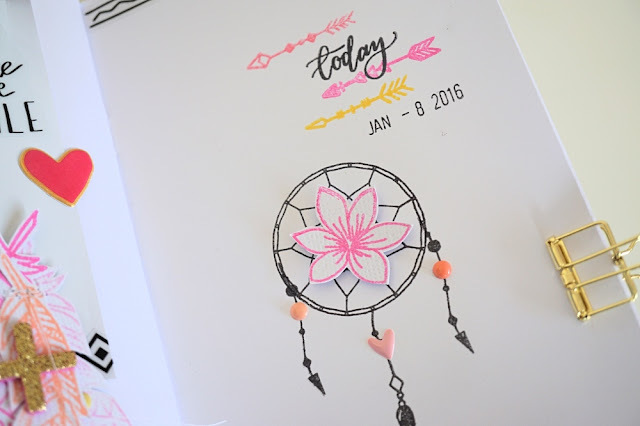 I also used a flower stamp set from Studio Forty and added a pink flower with glue dots on the centre of the dream catcher. Then I stamped some arrows in coral, pink and yellow above and the word „Today“. I also added the date with a roller stamp. Then I decorated everything with more transparent stickers and some enamel dots, enamel hearts and a puffy heart sticker in pink from my stash. For my 2nd TN spread I used a project life card from the „Moon Child“ collection. 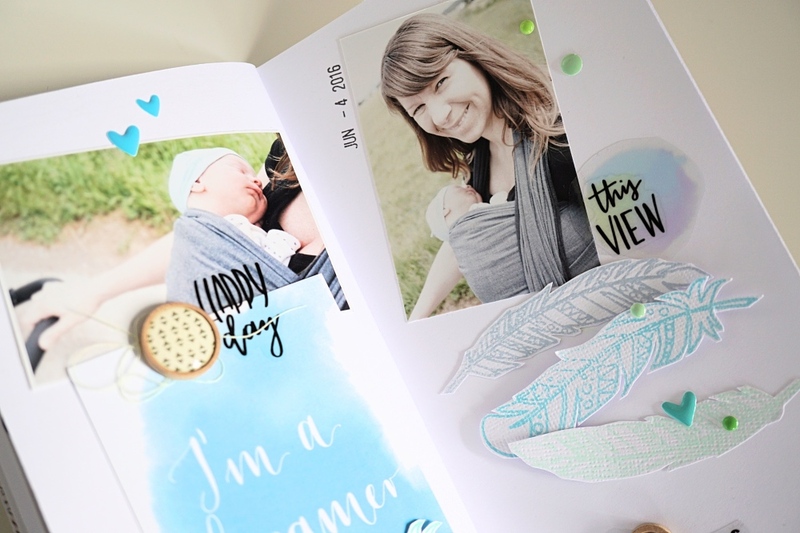 I love the color from this „ I´m a dreamer“ card so much and it matches perfectly to the photos from me and my son. I glued my photos on the top of the pages and the PL card on the left side. 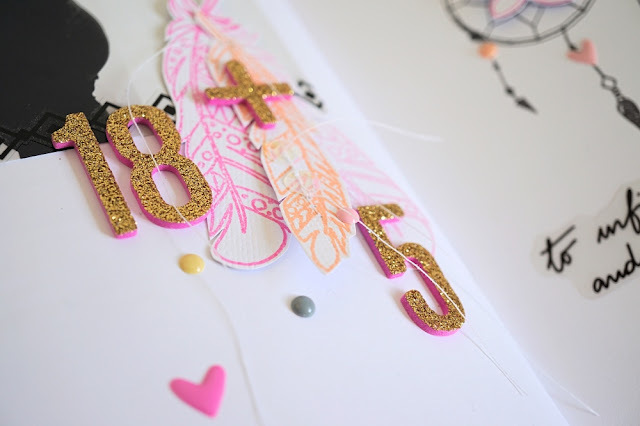 I also used the amazing feathers from the „Moon Child“ stamp set again. This time I stamped them in blue and green on white cardstock and cut them out. I glued one on the bottom of the PL card and the others on the right side under my photos. For this page I also used the gorgeous transparent circles in blue and green from the „Colors Of Memories“ sticker sheet. Over them I glued the transparent stickers „This View“ and „Memories“. 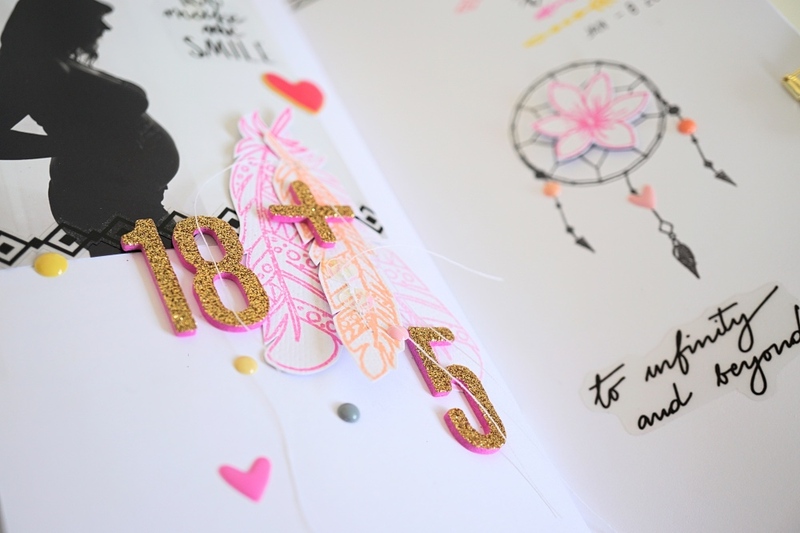 I wrote a little journaling under the PL card. To finish off my page I added some enamel dots and shapes and woodies on the TN spread. 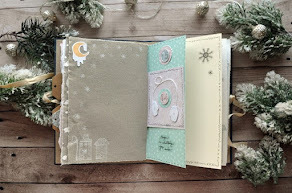 I hope you like my layouts in my travelers notebook with the „Moon Child“ collection from Studio Forty. Wow! Great notebook. 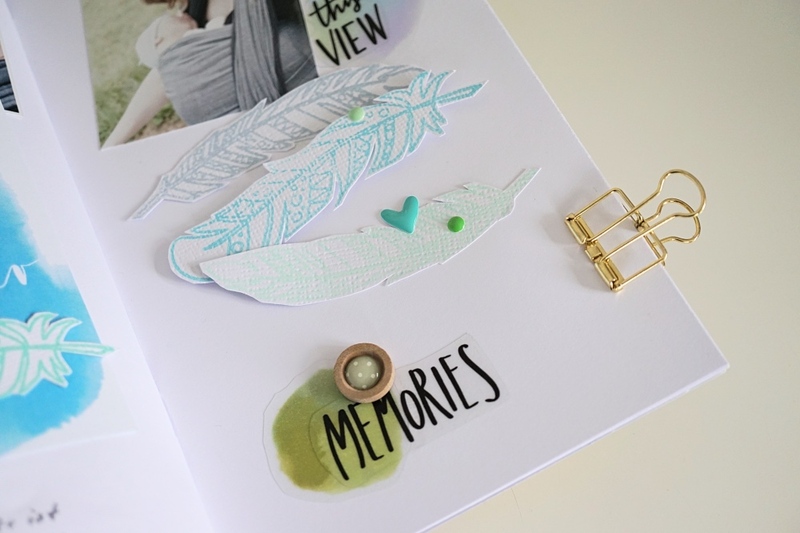 Perfect one for collecting memories.